Second prototype. Photo credit: Matt Dunlap. Water represents both the most essential substance of living and a dangerous, mysterious environment to us as land mammals. Indeed, the depths of the oceans are thought to be the last frontier of unexplored territory on Earth. Deploying the artificial agents in water puts them out of our direct control, truly on their own in a place where movements are imprecise, actions have unreliable outcomes, and changing environmental factors require constant adaptation. In Vessels, a continuous narrative emerges as the agents collectively learn to cope with uncertainty and adapt to their habitat. 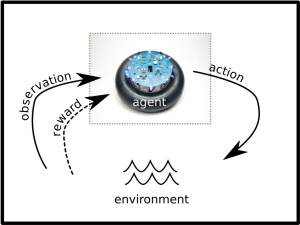 The robotic agents are entirely autonomous. They are not controlled from a central computer and their behaviours are not hard-coded. We stress here the relevance of behaviour as an emergent property as opposed to a predetermined strategy. 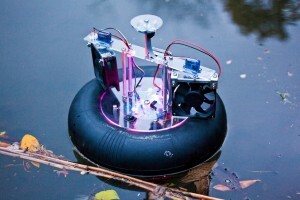 It has been shown both in nature and in engineering applications that designing for emergence can simplify tasks and produce more generalized, adaptable solutions. For example, Craig Reynolds (Reynolds 1987) demonstrated that the flocking behaviour of birds can be simulated by viewing each bird as an autonomous agent governed by three simple rules: stay close to neighbours, avoid collisions with neighbours, and match the velocity of neighbours. These autonomous agents are situated, that is, they view the world form their own perspective rather than from a global one (Pfeifer and Scheier 1999). 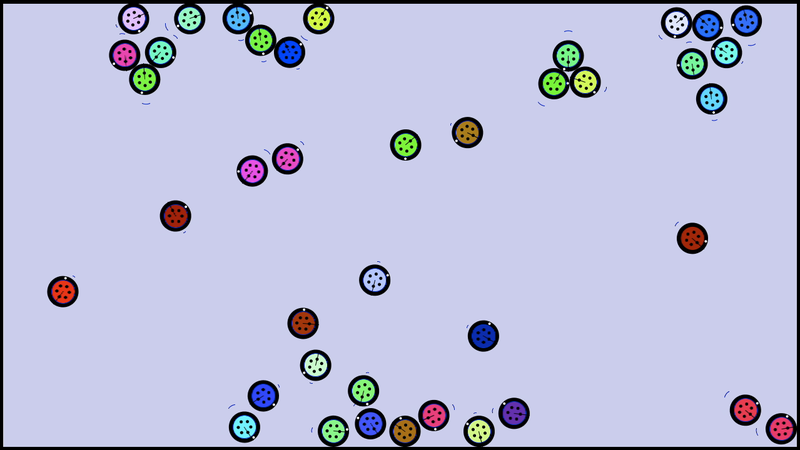 None of the simulated birds are programmed with a flocking behaviour: flocking emerges naturally from these simple rules. In the context of an art installation, this play between the agent’s situated view and the observer’s global view provides the basis for interesting reflection on social behaviour. Computer simulation of the robots. As both a biologically-inspired robotics experiment and art installation, we locate this project within the discipline of Artificial Life. Perhaps the most succinct description of ALife comes form Christopher Langton, who suggests that “Artificial Life can contribute to theoretical biology by locating life-as-we-know-it within the larger picture of life-as-it-could-be.” (Langton 1989) This statement directly connects scientific research-based observation with the more open-ended realm of the imagination. Vessels represents a hybrid of Alife research and art, where empirical experimentation with state of the art algorithms facilitates cultural/social reflection. Learning algorithms allow for the simple rules guiding emergence to change over time with respect to the dynamic, changing environment. Thus, new behaviours emerge that are unique to the installation environment. This application of machine learning as the foundation for aesthetic narrative represents a novel process in media arts. Two biologically-inspired approaches to machine learning are implemented in this work; Artificial Neural Networks (ANN), which model the development of neural pathways in the brain; and Genetic Programming (GP), which allows a population of computer programs to evolve through natural selection. Both methods are applied in the context of Reinforcement Learning (RL), which implies that agents learn through interactions with their environment. That is, they perform an action in the environment, receive some kind of feedback or reward, and adjust their behaviour slightly before performing another action. (Sutton and Barto, 1998) Over an extended process of trial and error, RL makes it possible for computers to do things that they were not explicitly programmed to do. A goal of Vessels is to frame this learning process as an observable component of the art work. Brooks, Rodney A. “Intelligence Without Representation.” Artificial Intelligence 47 (1987): 139—159. Kennedy, James F., Russel C. Eberhart, and Yuhui Shi. Swarm Intelligence. Morgan Kaufmann, 2001. Klein, Yves Amu. “Living Sculpture: The Art and Science of Creating Robotic Life.” Leonardo 31, no. 5 (1998): pp. 393–396. Langton, Christopher G., ed. Artificial Life: An Overview. A Bradford Book, 1995. Mitchell, Melanie. An Introduction to Genetic Algorithms. Third Printing. A Bradford Book, 1998. Penny, Simon. “Agents as Artwork: And Agent Design as Artistic Practice.” In Human Cognition and Social Agent Technology, edited by Kerstin Dautenhahn. John Benjamins Publishing Company, 2000. http://simonpenny.net/texts/agentdesign.html. ———. “Art and Artificial Life – A Primer.” In Proceedings of the Digital Arts and Culture Conference. Irvine: University of California, 2009. Pfeifer, Rolf, and Scheier, Christian. Understanding Intelligence. MIT Press, 1999. Reynolds, Craig W. “Flocks, Herds, and Schools: A Distributed Behavioral Model.” In Proceedings of the 14th Annual Conference on Computer Graphics and Interactive Techniques, 1987. Spaid, Sue. Ecovention, Current Art to Transform Ecologies. Contemporary Arts Center, 2002. Sutton, Richard S., and Andrew G. Barto. Reinforcement Learning: An Introduction. MIT Press, 1998. http://webdocs.cs.ualberta.ca/ sutton/book/the-book.html. Tenhaaf, Nell. “Perceptions of Self in Art and Intelligent Agents.” In Proceedings of the 2000 AAAI Fall Symposium on Socially Intelligent Agents: The Human in the Loop, edited by Kerstin Dautenhahn. North Falmouth: AAAI Press, 2000. Whitelaw, Mitchell. Metacreation: Art and Artificial Life. The MIT Press, 2004.